We’ve been looking at simply stunning staircases from all around the world and are continuously amazed by the spectacular designs that we come across. For a long time, we’ve said that a great staircase can become the feature of a property, whether it’s a staircase renovation or a brand new staircase entirely. But have you ever thought about a building made entirely of staircases? No, this isn’t something pulled out of our deepest imagination… it’s a groundbreaking vision that renowned architect Thomas Heatherwick is bringing to life over the pond in New York. With 154 staircases, almost 2,500 individual steps and 80 landings, it’s fair to say that it’s going to be a pretty big project. The unique structure will take pride of place in the yard and give people the opportunity to view the city from the designated areas within. The metal-clad staircases and landings will interconnect to form a honeycomb pattern that takes the shape of a tall vase. There’s no denying that the new landmark, named Vessel, is a stunning and innovative example of architecture. 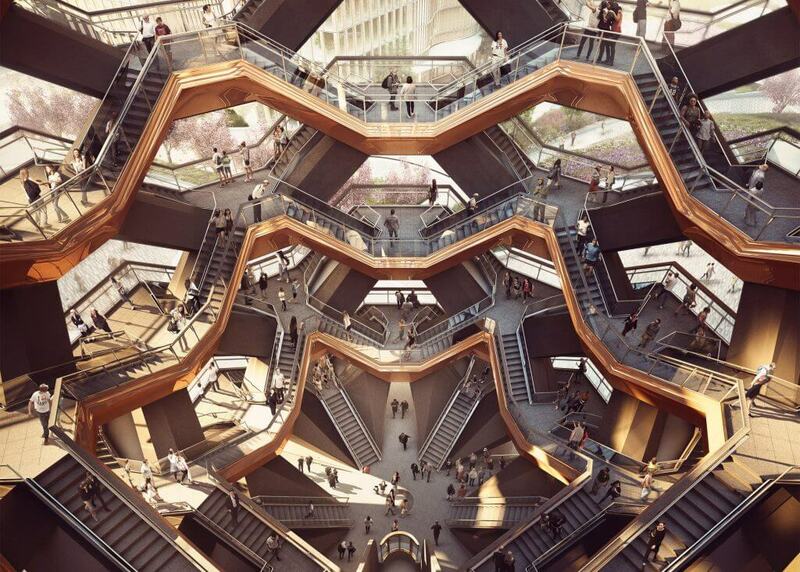 Yet, despite being made of 154 staircases, Vessel will still be wheelchair accessible with a grand elevator that will take people to the very top of the building so that nobody misses those breathtaking views. The inspiration behind the structure is something that we admire, as the idea actually came from a discarded flight of wooden stairs that Heatherwick found outside a building site during his student days. “It caught my imagination and I loved that it was part furniture and part infrastructure,” he said. “You could climb up stairs, jump on them, dance on them, get tired on them and then plonk yourself down on them.” We couldn’t agree more with the principle of this; staircases connect more than just storeys in a home, they connect people.